In my constant learning and brewing of Saison I have developed a bit of an adventurous side when it comes to brewing. Of course we all, as homebrewers, tend to go out of the box with what we do from time to time. It's fun to experiment and the results can often be fantastic. You can come up with something that you may not see commercially as it would be too much of a headache or too expensive. I've always wanted to work with grains that weren't typical in brewing and weren't that readily available just to see what they would yield. Buckwheat seems like a good choice to start with as there are some folks that have done some of the leg work already. A couple of the blogs to the left even have some posts about their experiences with buckwheat. Check them out as well! Amos just had a new blog post on the subject of brewing with buckwheat. You can take a look at his blog here. Ordered from Amazon as I couldn't find it locally. I've read that the yield from buckwheat is similar to corn. So I used that when I added the ingredient to Beersmith. Turns out that was pretty accurate as I hit all the numbers I projected. I shot for 67% efficiency since I'm working with a new material that is also unmalted and raw. I mad a starter of my current house blend. This blend is Wyeast 3726 and 3724, WLP565 and HF dregs that I had grown up. I always keep a portion of starter back to grow up again. 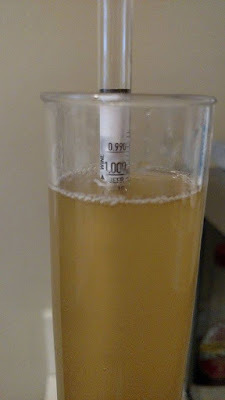 This time I did a 1200ml starter and kept 200ml, roughly, to continue using. I'm calling this my GA-01 blend. Check out that starter! It was insane! This stuff was ready to crawl out of the flask! Below is the recipe I settled on. I wanted to use the buckwheat in a portion that I would hopefully notice what it was providing. I think it worked as the wort smelled and tasted very nice. It smelled of nuts, corn and bit earthy. Really nice! lauter! Fermented with my GA-01 blend. 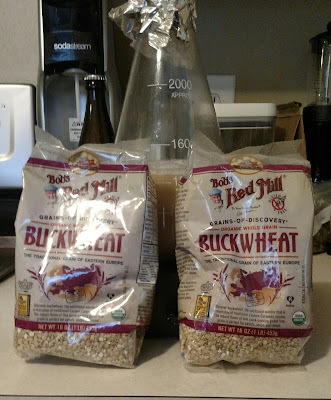 I ground 2 pounds of buckwheat with a half pound of the base malt added that to a pot to do a cereal mash. The base malt was used to help get a head start in converting the starches from the buckwheat. I used enough water to make it the consistency of a think oatmeal. When I added heat to it I ended up adding a bit more water to keep it that same consistency. As it heated I kept stirring to prevent any scorching. In no time at all it was up to a boil. This is where you really have to pay attention. If you let the goop sit too long, it will burn or it will bubble over. I just kept stirring with a wooden spoon the whole time. After 15 minutes of boiling, I felt like it was ready to go. 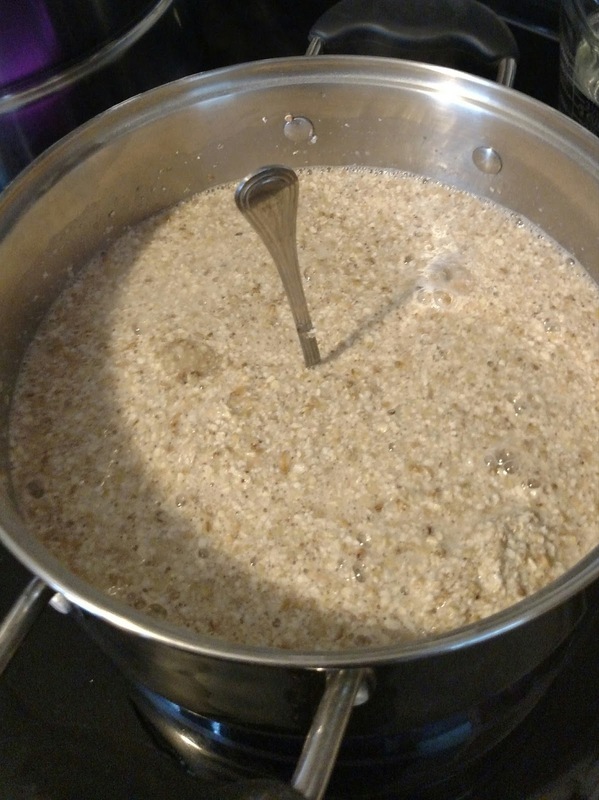 Consistency of thick oatmeal. I added water along the way to get it where I wanted it. While I had the cereal mash heating up, I mashed in the main mash and held it at 133F for a protein rest. I figured I could use hot water and the cereal mash to bring it up to the 146-148F I was looking for. I also added in about 1/4th of a pound of rice hulls just to help with lautering as I figured the cereal mash would slow things down. Got to drink Saison when brewing Saison. 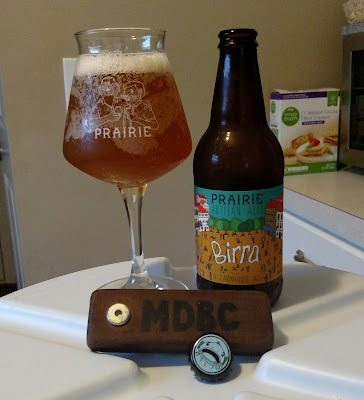 I really love this beer from Prairie Artisan Ales! I added everything together and used enough water to hit 146F. I held it there for 75 minutes total to make sure I got as much conversion as I could. I stirred the mash at the 45 min mark and check the temperature. It had fallen to 144F at that time. By the end of the mash the temp had fallen to 142F. Mix of cereal mash and the rest of the grist. 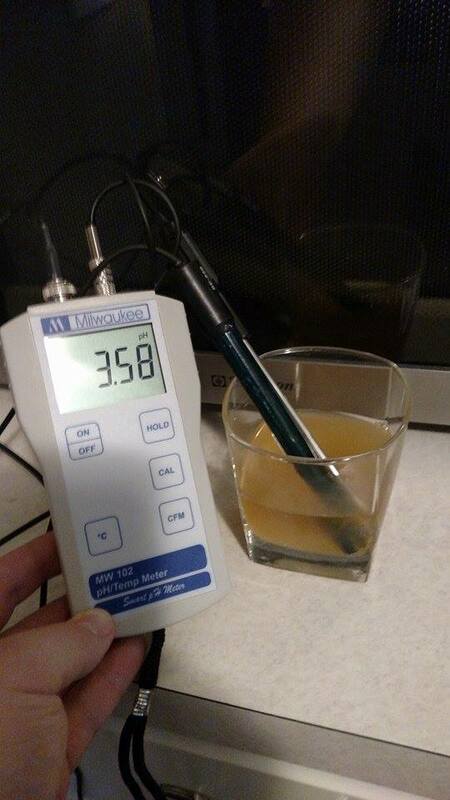 I fly sparged with 171F water to gather just under 7.5 gallons of wort. This took forever! The buckwheat really gummed up the works! I got about a gallon out before I had to stir everything and let it rest again. I ended up adding more rice hulls to help out the process. I'll know next time to add more at the beginning. I started with 1/3 of a pound and ended up adding about another 1/2 pound. I had to stir and restart a couple times. This was definitely the most difficult and longest lauter I've done. I struggled getting clear wort from it. 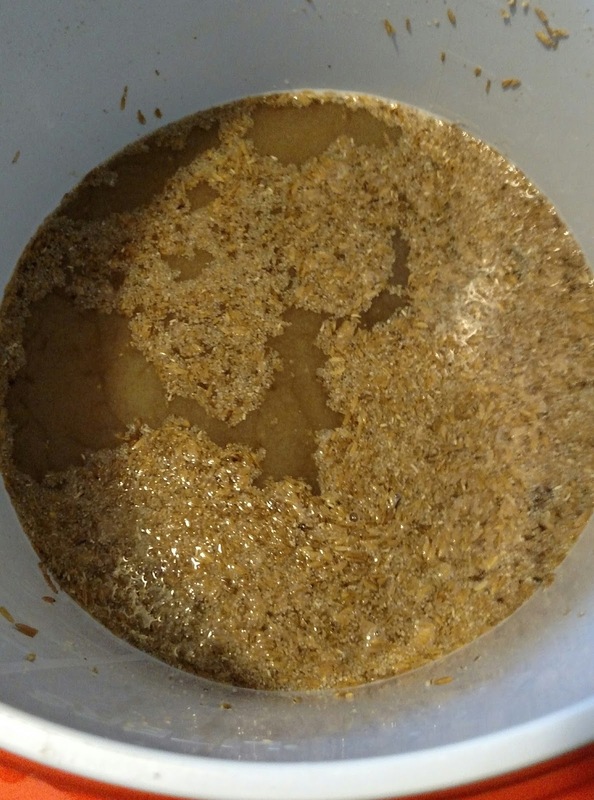 All the proteins and tiny particles made a cake of the mash and contributed to the difficult lauter! When it was all said and done, I had a beautiful wort that smelled and tasted fantastic. It had a cloudiness to it that I really liked. It looked to be full of proteins from the buckwheat. The flavor and aroma were fantastic as well. I don't actually strive for clear beers so if the end result is cloudy, that will be fine with me! Everything went normal with the boil and then I cooled to 75F to pitch the yeast. 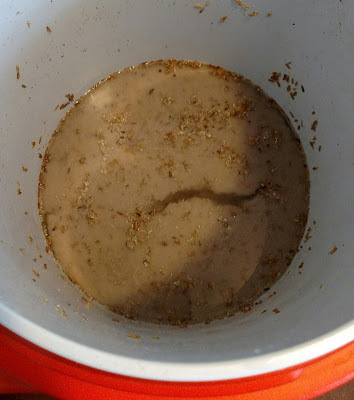 In six hours I had full krausen. 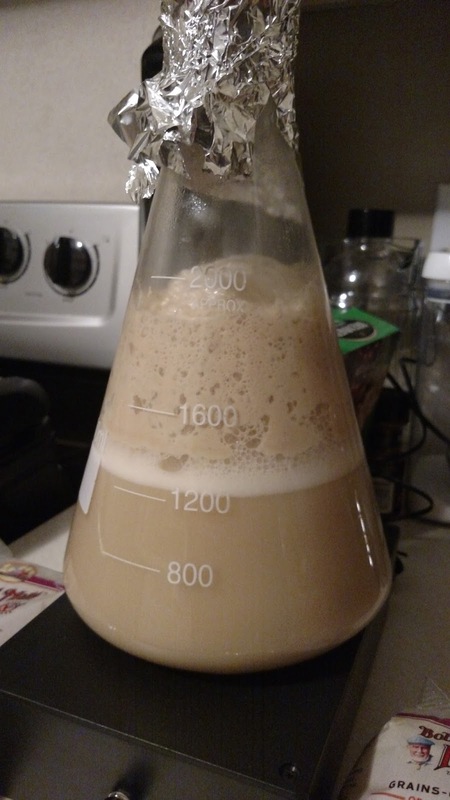 Something to be said for having a healthy starter full of hungry yeast! Trying out my new Big Mouth Bubbler with built in spigot. Brewing with buckwheat was really a different experience. I really don't mind doing the cereal mash and the rest of the brew day went as planned, minus the lauter. I'll handle that on the front end next time! If you have been thinking about brewing with unmalted or raw grains, go for it. It really isn't much more work and I enjoyed the process a lot. All you need is a large enough pot to do the cereal mash in. Just make sure you adjust your temperatures and compensate for adding the boiling gloop from the cereal mash. Oh and use plenty of rice hulls!! I'll post back with my results. I believe I'll keep this one as it is. 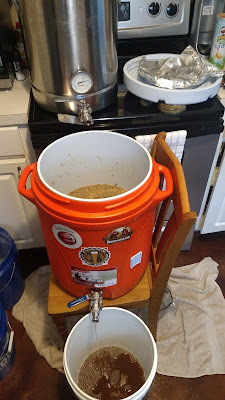 I have another couple bags of buckwheat that I may duplicate this recipe (if I like it) and blend with some older "Lambic-style" beers I have brewed. Amos really likes blending his and I think I'd like to try that. I'm a fan of blending older Saison or "Lambic-style" beers with fresh hoppy Saisons. 8-2-15: Sample taken. Gravity sitting at 1.004. Still a little action happening. Some yeast still in suspension as it is pretty cloudy. I'm sure it has some cloudiness from the buckwheat proteins as well. Flavors are a tad tart with some graininess mixed in. I'm going to decide whether or not to dry hop it or not. I'm pretty pleased with the flavors. My "house" character is showing through. I'll take a pH reading and re-check the gravity later in the week. If I'm still happy with it I'll bottle as is. 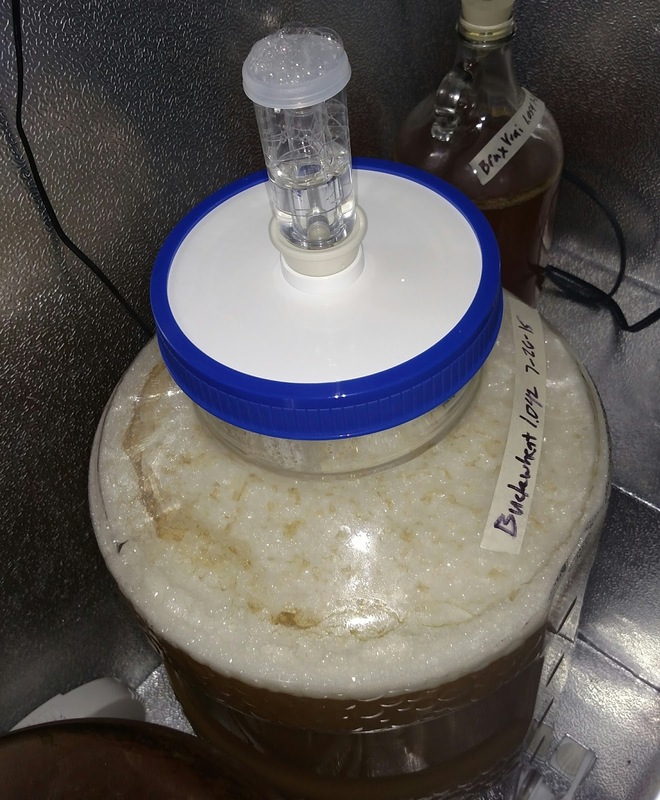 8-21-15: Gravity stable at 1.004. I took a pH reading and it's already at 3.58. Flavors are tart and lemony with a hint of funk. Some grainy, nutty notes. I think it's ready to keg or bottle and see what happens with some carbonation. Less than a month and the pH is already down this far! 1.004 for 2 weeks now. 12-31-15: Thought this was getting where I wanted but I now pick up hints of acetic character. 2-3-16: Down the drain it went. The Big Mouth Bubbler I had this in definitely let in WAY too much O2. Unfortunate because I really liked where this was heading.